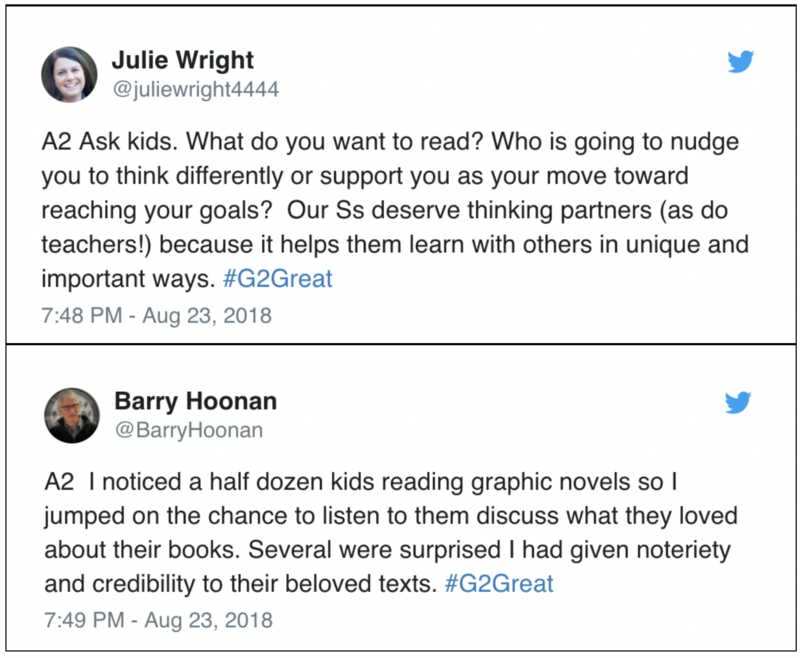 We were delighted to welcome first time guest hosts, Julie Wright and Barry Hoonan to our #G2great chat table on August 23, 2018. I was perched and ready with fingers resting happily on my computer keyboard well before official chat start time, eagerly anticipating a lively discussion around their amazing new book, What Are You Grouping For? 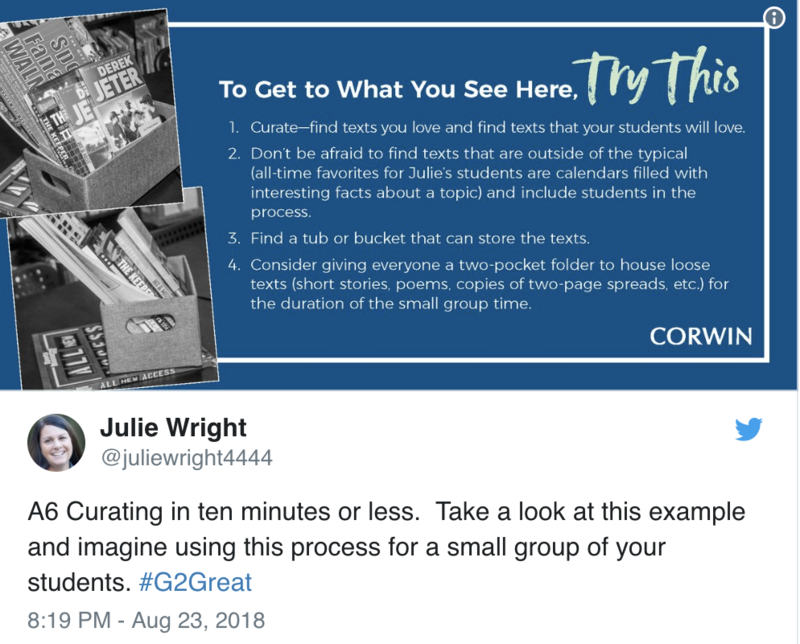 How to Guide Small Groups Based on Readers – Not the Book (grades 3-8) Corwin 2018. From the first “Welcome friends,” all that the words “lively discussion” entail burst into life aka Twitter passion. Small groups afford time for differentiated instruction at all grade levels. As students move up the grades, however, fewer teachers make room for these opportunities. 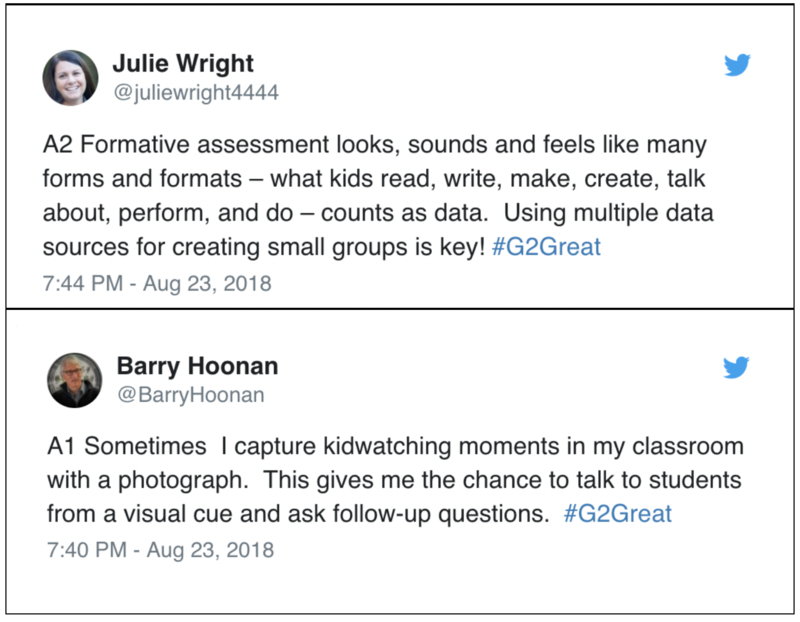 Julie and Barry provide a flexible open-ended design that will help teachers at all grade levels envision what these more versatile small groups could look like, sound like and feel like. Small groups often focus on homogeneous guided reading groups based on reading levels. Heterogeneous options they describe are the missing piece that would break free of the constraints of narrow groupings. 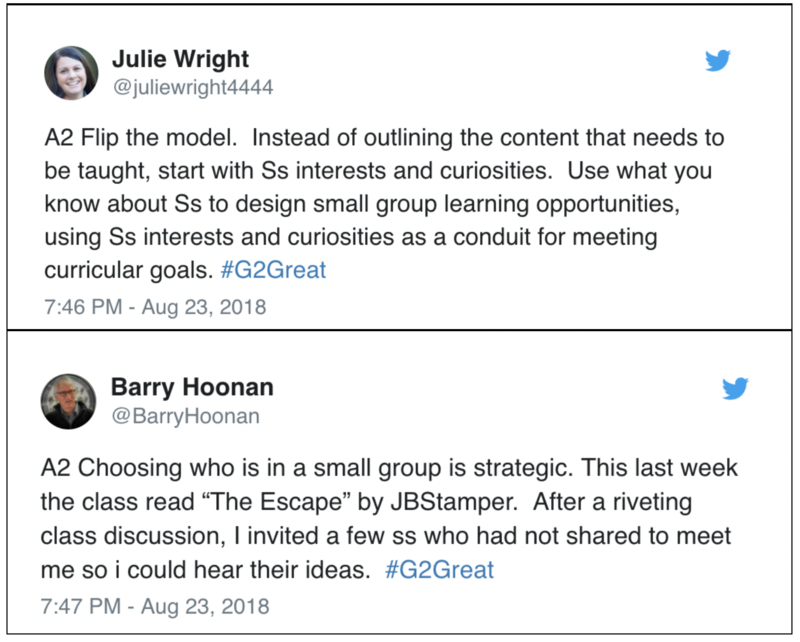 Guided reading is an effective structure when done selectively and in the right spirit, but Julie and Barry wisely broaden this perspective in ways that will maximize our small group power potential. Julie and Barry propose responsive small groups that address both the instructional and emotional needs of children and thus are created for a variety of reasons in a variety of ways while acknowledging the tremendous role curiosity and interest play in this grouping process. They are not asking us to abandon other practices but to increase the scope of our small group lens so that the passions students carry in their back pockets can become a grouping informant to explore other options. In other words, we are not closing the door to familiar structures like guided reading, but rather wisely opening that door even wider to welcome the passion fueled groupings that have previously gone untapped. Across the pages of their wonderful book, they describe these options so vividly that teachers can pull from a treasure chest of thirty-one grouping possibilities listed at the front of the book according to the specific needs of students. 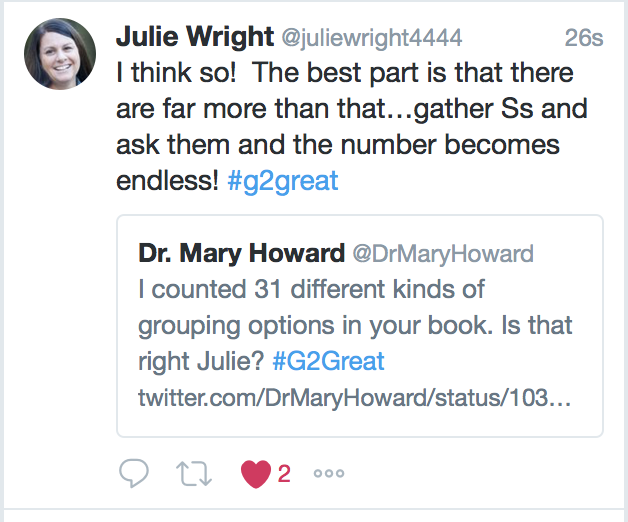 But as Julie reminds us in the tweet below, that number multiplies exponentially if we can have the courage to invite the passions and interests of students to the small group decision-making table. 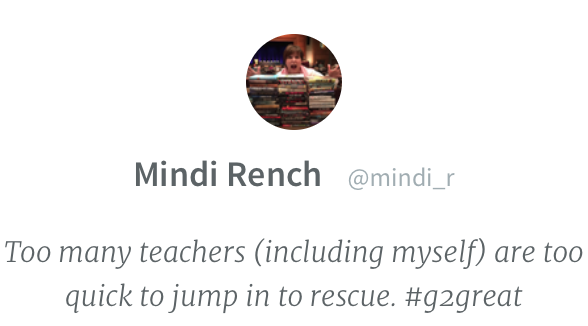 When I’m honored to write a #G2Great post on a book, my goal is to honor the book and author/s while drawing from the chat experience. To do this, I first look to the book for inspiration by exploring a few tidbits of wonder as I did above. Then I look to the chat for social media tidbits of wonder from our author/s to extend the book. A book/chat merger helps me mine for big picture messages. 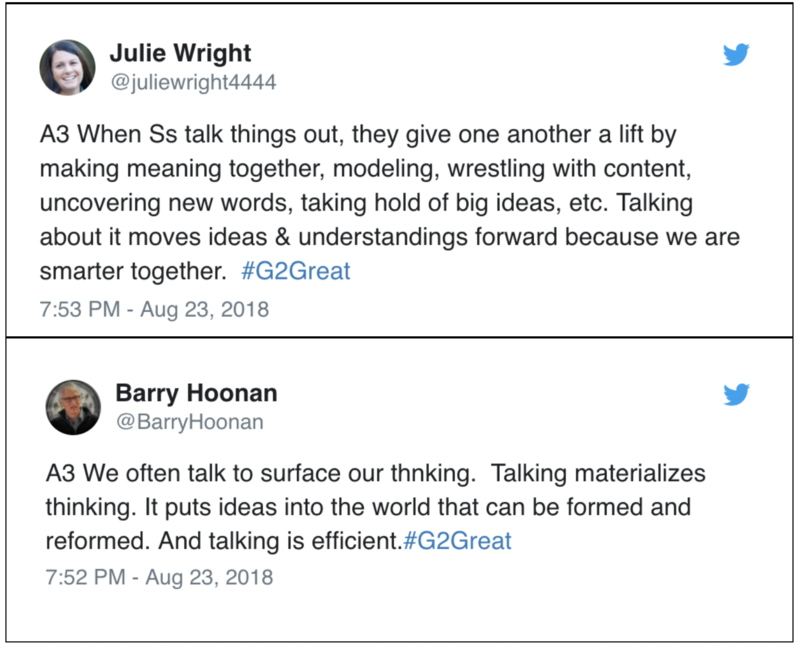 Perusing our #G2Great chat WAKE for patterns wasn’t an easy task since Barry and Julie each tweeted thirty-three brilliant ideas. 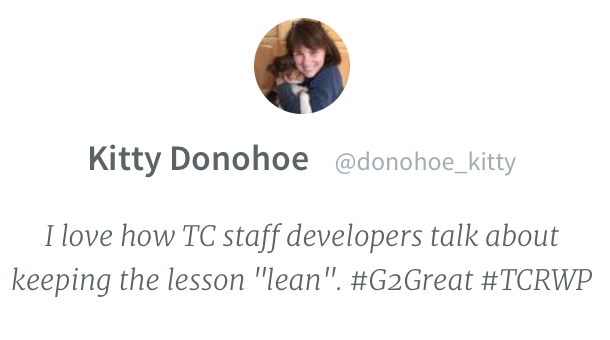 While tweet awesomeness challenged my mining process, patterns began to emerge as a starting point to bring their combined book-twitter wisdom to life. To maintain my focus on these patterns, I decided to use a pair of tweets per point with more selected tweets at the end. 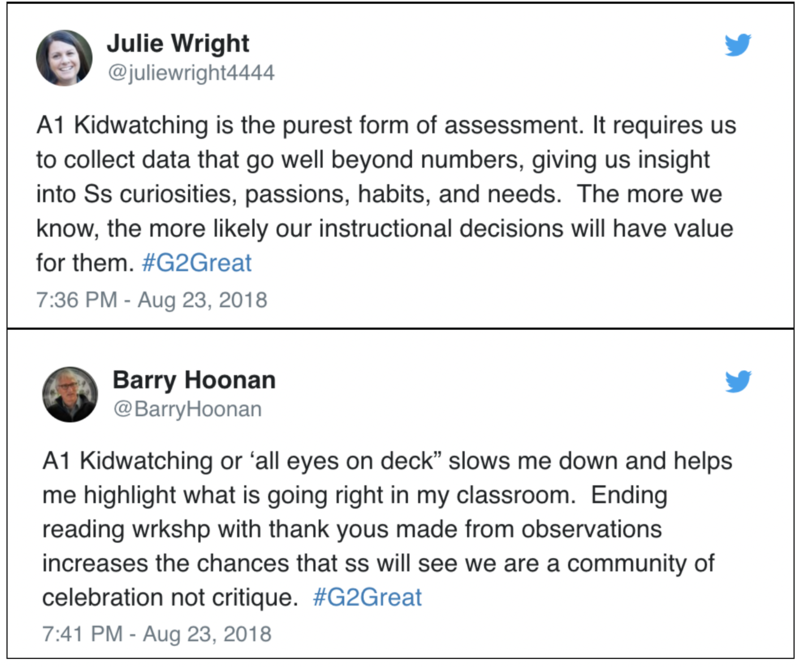 Our first question about the role of kidwatching in small groups initiated a frenzy of chat enthusiasm that exploded across the twittersphere. Kidwatching activates a directional GPS system that inspires us to breathe deeply, slow down and step back. This sense of presence makes us privy to precious in-the-moment opportunities where the engaging work children do on their own points the way to next step possibilities. Julie emphasized that noticings help us to move beyond numbers that may blur our view of students in the throes of learning. Her focus on curiosities, passions, habits and needs illustrate critical features of learning that go unnoticed without intentional looking. Barry reminds us that this is a celebration rather than a critique. I loved his “all eyes on deck” reference focused squarely on what is “right” about the teaching-learning process in this celebratory child gazing. Changing our stance from teacher to observer with a teacher-learner mindset encourages us to keep our eyes and ears open for instructional inroads that could beckon us forward. From the moment I began reading this wonderful book, I could imagine teachers inspired to plant new small groups seeds that would become beautiful blossoms across the learning year. 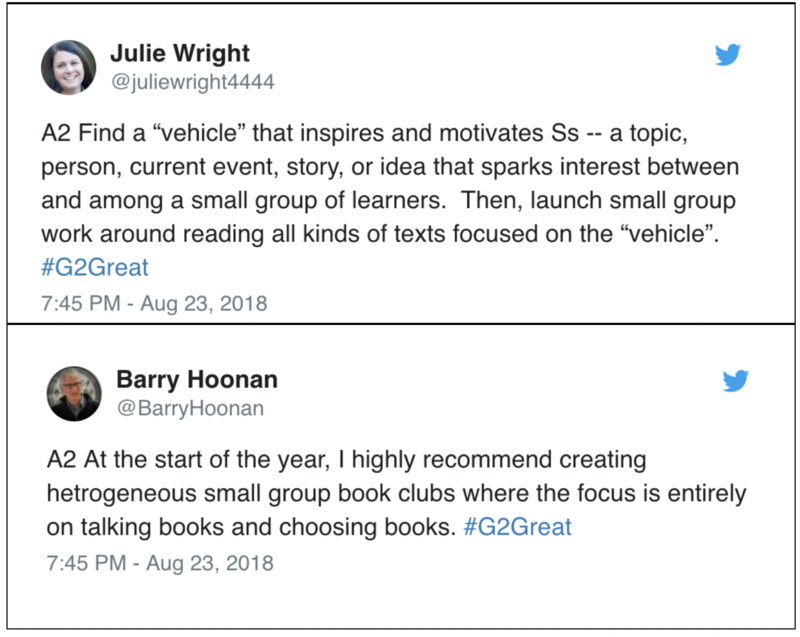 Julie asks us to envision small groups as a vehicle for nourishing these seeds as we shift from teaching students how to read and supporting their unique journey to becoming readers. 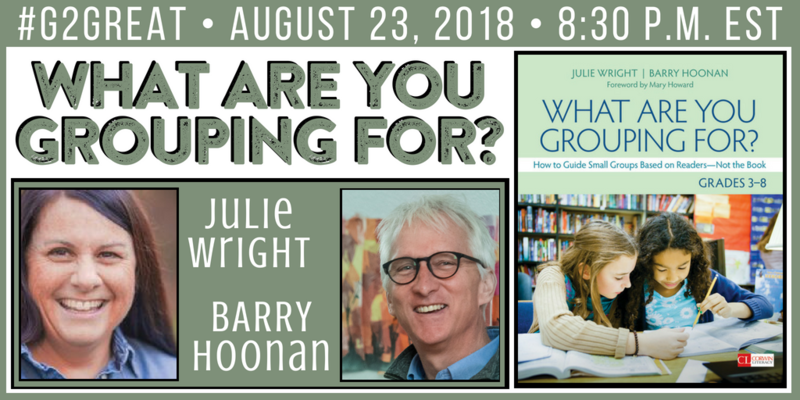 Typically, teachers are asked to create leveled small groups at the beginning of the year but Barry suggests beginning instead with heterongeous groups that will help us to get to know students as readers and set the stage for future groupings. Relinquishing teacher control initially for the purpose of understanding learners reminds me of the Roaming in the Known phase of Reading Recovery. Once we know what inspires and motivates our learners, this fuels our efforts to nurture becoming across varied settings. When the choices that we make about small groups are made solely on isolated numbers, even if those numbers may be relevant, we may alleviate the opportunity to form groups informed by the day-to-day learning experiences that can enrich our grouping efforts both within and beyond those settings. Julie refers to strategic decision-making as “flipping” the traditional model focused on content and begin by using our students’ interests and curiosities to generate learning goals. Barry implores us to make ‘strategic choices’ based on what we are noticing within those experiences in the learning day. These opportunities could then become “invitations” for a wide range of smaller settings where we can offer a gentle nudge across contexts when we recognize a need for such opportunities. In this way, small groups become student-centered invitational experiences that widen our view what is possible. One of the hallmarks of effective grouping experiences is that students’ voices rise above our own. Yet too often the opposite seems to be the case. Julie highlights the give and take aspect of talk as a way to invite students to make sense of their thinking in the company of supportive others in a non threatening context of smaller groups. This “smarter together” stance where multiple voices can merge respectfully into one will allow us to use talk to meander our way to collective understanding. Barry asks us to use talk as a conduit that will help new thinking “materialize” through these conversations so that we can lift that thinking into the discussion air and “put new ideas into the world.” I love his point that this inspired talk is not an end zone that we seek to reach but a pathway where we can form and reform ideas in the course of inspired shared dialogue in varied settings. I can’t think of a more critical small group purpose than using those experiences as a way to celebrate students within and beyond the small group and as a motivation for forming new learning opportunities. 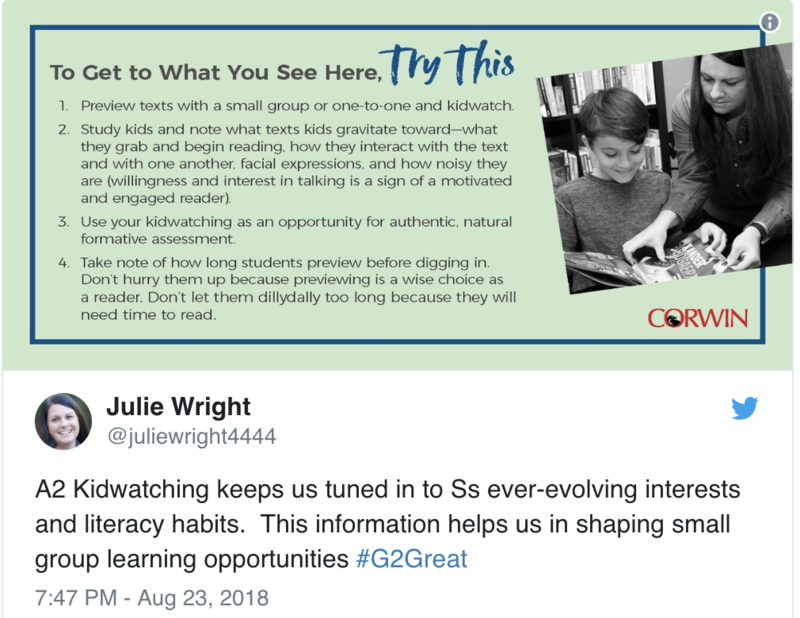 Julie encourages us to ask our students about their reading choices as a gentle nudge toward using their preferences in working toward learning goals. This is essential considering we elevate goals done in the spirit of interests. She further emphasizes the value of partnerships where texts can be used as a conduit in collaborative explorations that deepen and fine-tune initial thinking. Barry highlights this celebratory spirit by acknowledging and supporting their reading identities through student driven choices. The fact that his students expressed surprise when he celebrated graphic novels as a relevant choice illustrates the potential danger when we negate certain texts as unworthy rather than leaning joyfully into them. Barry clearly leans in with gusto. It would be hard to argue that student independence is the ultimate goal of small group endeavors and our student-centered bridge will support this shift in responsibility. When teachers maintain control for small group learning rather than relinquishing those reins to students, this transfer of independence from teacher to student is unlikely. As Julie so eloquently reminds, we must embrace this handover of responsibility by supporting their increasing control. We look to students for signs that point the way and then trust them as they move across a bridge leading to student agency. Barry illustrates that the rituals we put in place at the beginning of the year can help us to support and strengthen this goal across the year. We increase the likelihood of this transfer of responsibility when we put students in the small group driver’s seat as they become familiarized with routines and then have the courage to step back so that they can assume ownership of this process. One of the topics that I found myself returning to again and again in the book and the chat was the idea of text curation. 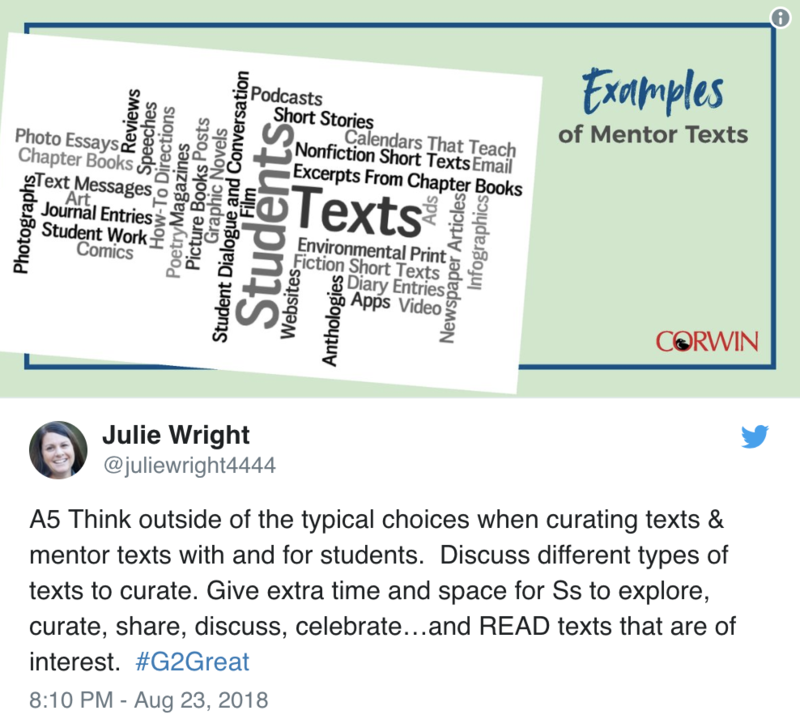 These text collections are a varied gathering of options for reading based on student interests used both within and beyond small group experiences. Julie reminds us that these teacher vs student curations are not an either/or proposition but that we must always strive to include students in this process. This may reflect student created displays of topics, genre, authors or learning goals coupled with advertisements to inspire new small groups, with a range range of text options welcomed. Barry emphasizes the role of texts, students and teachers in this curation process, but again asks us to keep our sights on relinquishing curation responsibility to students. 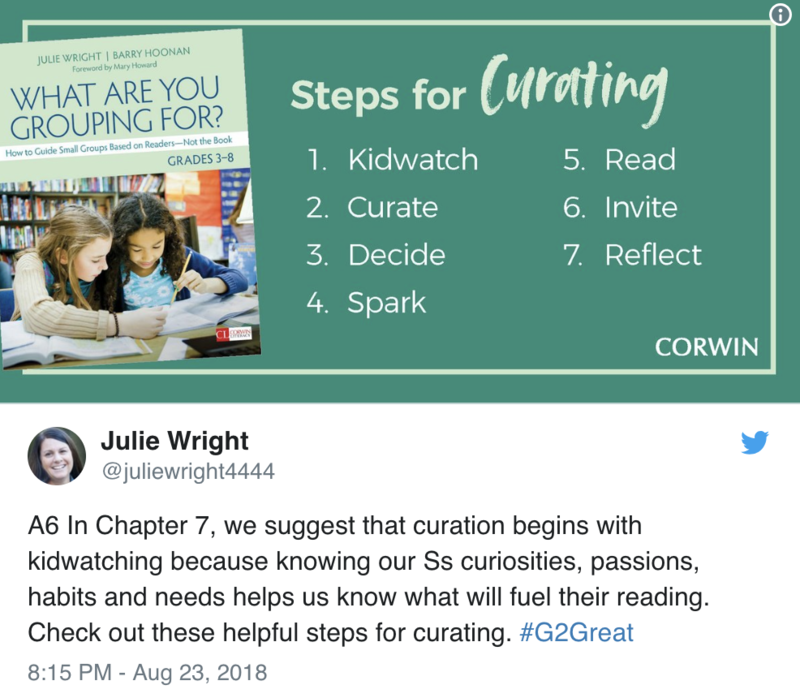 When students do this gathering for themselves and their peers, those collections will represent their interests, passions and curious wonderings as they own this process. As a result, we are afforded the gift of understanding them as learners by virtue of the very collections they curate. Each of these eight points work in tandem rather than in isolation and this final point in no different. Assessment is not something we do and then move on but what we do across the year as we inform, form, reform– all the while gather new assessment informants for this small group work. Julie extends this perspective by asking us to broaden our view of what assessment can look like, sound like and feel like. A wide range of multiple sources of formative data support our next step thinking by allowing us to see students from all sides. I included Barry’s reference to the use of student photographs since I see this as a powerful concrete visual assessment tool that can become a springboard to promote questions and ponderings. The back and forth discussion that can rise from this pictorial view of learning affords assessment information that might otherwise be invisible since the photo captures learning in action and the dialogue it inspires allows us to relive those experiences. I would like to extend a very personal heartfelt thank you to Julie and Barry – not only for writing this incredible book but for trusting me to write a foreword that would do their book justice. 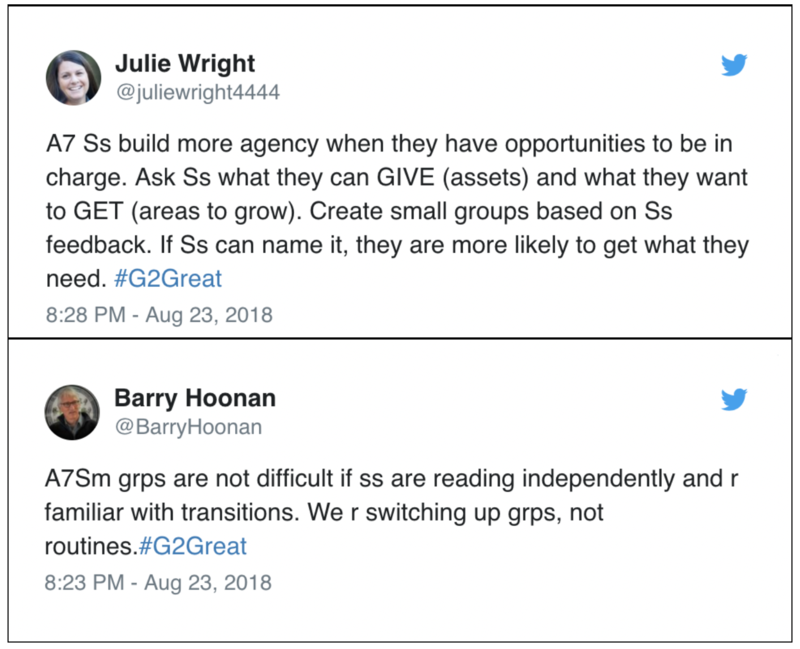 On behalf of myself and co-moderators, Fran, Jenn and Amy, we are deeply grateful for their generous sharing of small group wisdom with our #G2Great family of enthusiastic learners. As a result, I can envision a wide repertoire of student-centered flexible small group designs that will “engage, inspire, and foster collaboration.” I know that this wonderful book will empower teachers to step out of the existing small group boxes that have existed for too long so that they could imagine what is possible when we are willing to break free of the ties that bind so that students can do the same. We see it my friends. We definitely see it! 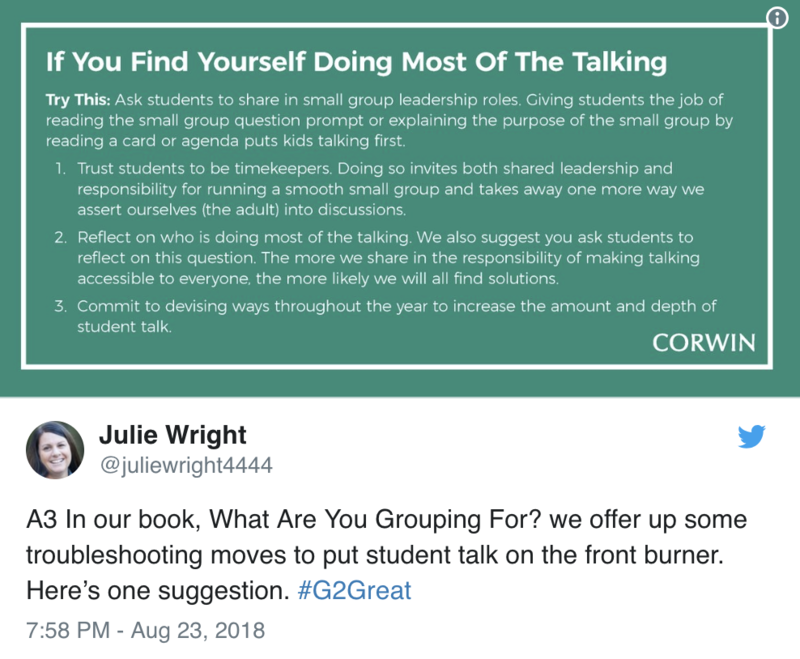 Corwin Book Link: What Are You Grouping For? 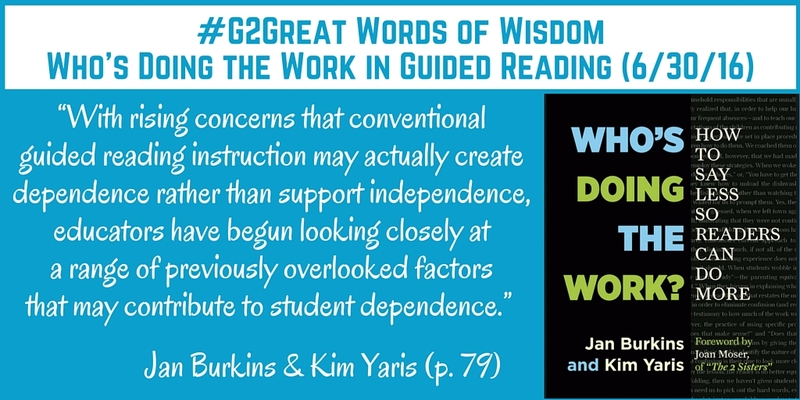 On June 30th #G2Great continued our journey with Jan Burkins and Kim Yaris in the third of a four-part series inspired by their book, Who’s Doing the Work: How to Say Less So Readers Can Do More (Stenhouse 2016). As I reflect on the series and re-read my own marked up and treasured copy of their book I feel compelled to stand once again on our #G2Great metaphorical mountain and shout out to all educators to get a copy of this book, read this book and take on the charge to lead students to independence in reading. Jan and Kim introduced us to next generation guided reading in chapter 4 of their book. The quote above from Jan and Kim resonates with me because over the years as I have worked with students and teachers around guided reading this was the thing that got me stuck each time. I did not see the transfer happening and it seemed like the adults (including myself) were doing much of the work while students took on a role that seemed more compliant than cognitive when it came to engagement and strategic work in the reading process. In fact, if I am honest, I generally opted for strategy groups or some hybrid type of small group rather than guided reading for this very reason. As I read the book and reflect on the chat I am making connections between the importance of teaching towards independence for our students in school and raising my teenagers to be independent in life. In my mind I believe one thing, but when I look back and reflect over my own words and actions I realize that in literacy and in life I am guilty of providing too much support so that my students and my own teenagers are still dependent on me when what I believe is that I want them to be independent. My actions and words have not been aligned to the end result I was seeking. I want independence for these learners, however I am so worried about the mistakes that happen along the way in the learning process that I jump in and sabotage their journey to independence. Picture this, you are teaching your child to ride a bicycle, you hold onto the back of the seat. You run along behind, still holding the seat. Back probably aching, but you are not worried or scared because you are holding on. Your child is excited, perhaps slightly scared but more excited about the potential of riding on their own like a big kid. You want to let go of the seat, but you can’t. You are worried about what will happen if you let go. Then as your brother watches, he steps in because he knows you will never let go of the seat and his nephew will never learn to ride that bike if his mother continues to hold that seat. This was me and unfortunately, I am still trying so hard to let go of that seat. This book has helped me professionally and personally to realize that I have to let go of the seat. To do that I need to ensure that I provide an environment where there is safety while also letting students (or my teenagers) make the more specific decisions. I can still provide support by setting up metacognitive prompts or questions to support their thinking, not mine. I can provide prompts that are both general and reflective with lean coaching in with agentive questions such as, “What can you try?” “What do you know?” and “What else can you try?” In other words, I can adjust my teaching to afford students the benefits that come with next generation guided reading. In reflecting on the June 30th chat, Elisa’s tweet above reminds me why it is critical to support independence in our learners. Guided reading is the step just before independent reading when we consider its relation to the gradual release of responsibility. When we provide too much support or do all the work, students are not prepared to do that work on their own. They do not have enough practice in problem-solving in order to know when they are stuck and what to do when reading breaks down. Students can practice using their problem-solving skills when our questions or prompts allow students to figure it out themselves. Questions such as “What can you try?” “What do you know already?” and “How can you check?” provide just enough support that it encourages students to think and problem solve so that when they are on their own reading independently they can apply these strategies alone. These reflective or metacognitive questions promote thinking promote thinking that will enhance awareness into their own processes as well as the flexibility to use these in other texts independently. Teachers use next generation guided reading as an opportunity to learn about students’ reading processes. Rather than providing a heavy book introduction, teachers of next generation guided reading approach the book introduction as a facilitator of the work that leads to independence. Teachers may ask “How will you figure out what this book is about? Or “What should we do first to get started in this book?” This provides an opportunity to observe and learn from students so that instruction can be more intentional and specific to support independence in reading. 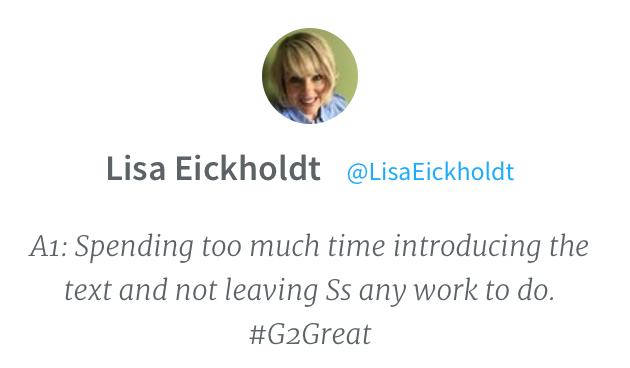 Additionally, as Lisa’s tweet below points out that too often a lengthy book introduction takes away precious reading time for students. If we want independent readers we need to provide the time for students to engage in just that, with our careful observing eyes and ears as we take note of what students are doing and only jumping in when necessary. Teacher talk is minimal in next generation guided reading, allowing students to talk, think and process the text. Often teachers lament on not allowing for enough wait time, but if we reframe the term wait time to processing time perhaps we can trick ourselves into waiting longer as students are processing or thinking about a text. I have come to the realization that indeed it is scary to let go of the seat of the bicycle and let them ride off into the sunset. Perhaps that is why my brother and sister in law had to teach my children how to ride a bike. However if I watch this “video” play through in my mind again I can see different ways I could have improved my teaching by letting go of the bicycle. Picture this new scenario, you are teaching your child to ride a bicycle, you hold onto the back of the seat. You run along behind, still holding the seat. Back probably aching, but you are not worried or scared because you are holding on. Your child is excited, perhaps slightly scared but more excited about the potential of riding on their own like a big kid. You want to let go of the seat, but before you do you watch your child’s pedaling, you watch your child’s balance and you watch your child keep their eyes on the road and their hands steady on the handlebars. You observe and assess when they are ready for you to let go of the seat. You prompt your child with lean coaching as you are still holding on, but lighter than before. You are not worried about what will happen if you let go because you have worked through possibilities with your child and planned for get up again and try it strategies. You know that when you let go they might lose balance that first time and fall, but you will problem solve and talk through how to fall and how to get up again. Then as your brother watches, you let go, your child loses balance and falls. Your child gets up, shrugs off the fall and says, “Next time I will go longer without you holding on!” Your brother runs over and gives your child a high five and flashes a knowing smile in your direction. Before you know it…your child is off and riding. That’s what doing the work looks like in next generation guided reading — our students are off and reading. 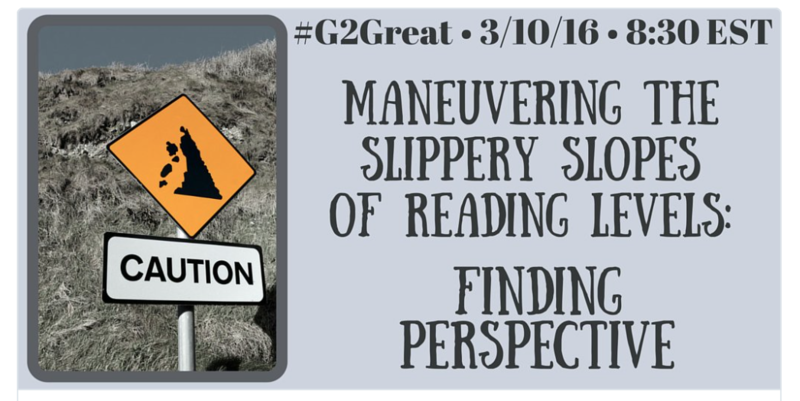 On March 10, 2016 #G2Great teased out our perspectives around reading levels. 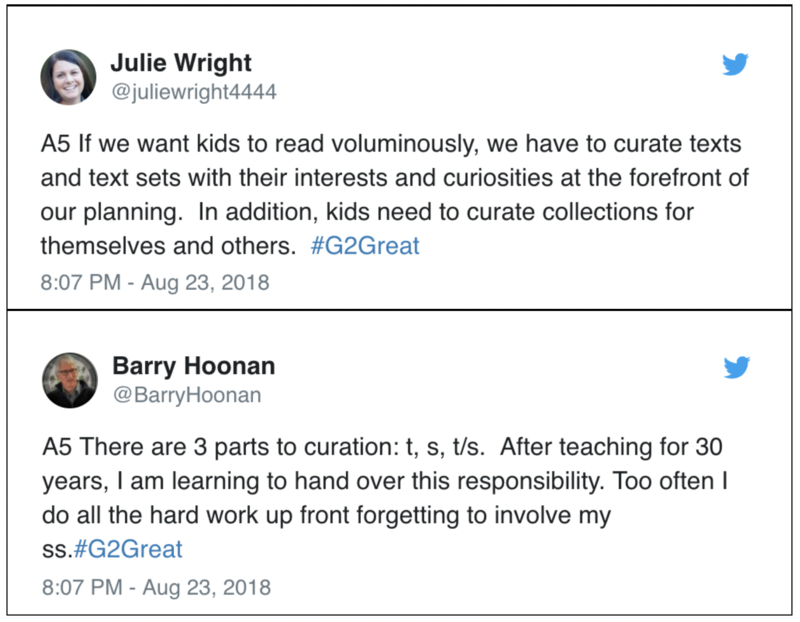 In reading through the tweets from our always thinking and learning #G2Great PLN, I focused my reflection and thoughts around these three ideas. How do we teach them to do it on their own? While levels have an important place in reading instruction, we have to keep one question in mind. That question is and always should be “How do we teach them to do it on their own?” This is the question that lingers in my mind as I raise my own children and every day as I walk through the halls of a school. If I am honest, this is at the front of my mind anytime I put a learner at the center and make a plan for instruction. I think of this question whether it is my children, teachers or students. Whether we talk about parenting or teaching (adults or students for that matter) what we are actually speaking about is learning. Learning. That is it. The goal for learning is independence in whatever “thing” we are teaching. In the case of reading the goal is independence. Independence in reading looks like someone who chooses their own books, is responsible for their own reading, is curious and, therefore motivated to pick up something and read. Ultimately, the reader will experience growth in learning because of the reading. I am grateful to have @jdolci as part of my PLN because when he sent this tweet out into the Twitterverse he put the image in my mind that represents what I believe all readers can be. But it cannot just be about independence, there is more to it than that. The second part of teaching them how to do this on their own is considering how we can best support students as they are learning to read texts with increasing complexity. It seems here is where the levels really come into play. As Irene Fountas taught us “Levels have an important place in the hands of teachers who understand them.” This quote moved our chat in a direction of so many thoughtful responses. 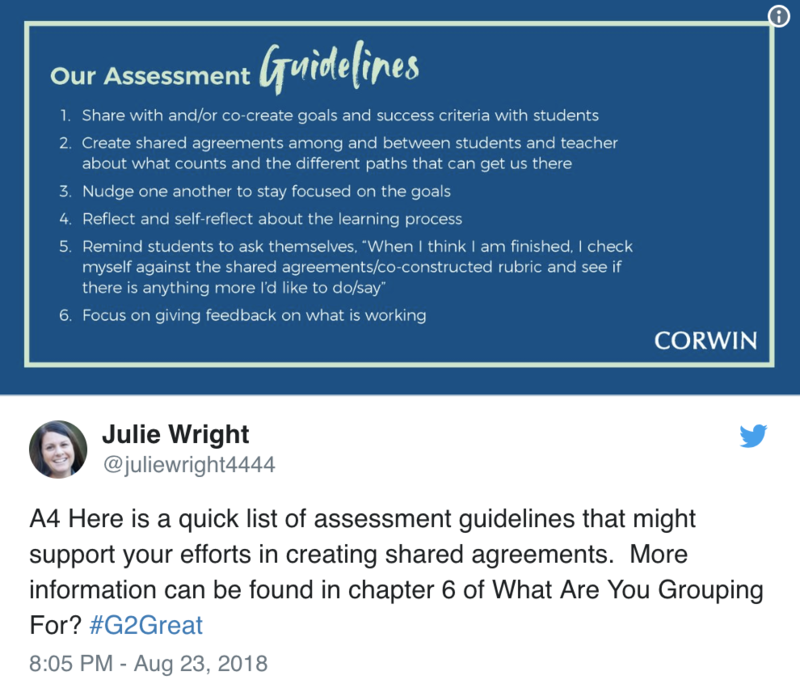 @Kari_Yates and @lau7210 rallied our #G2Great troops around the idea of levels as instructional tools used by the teacher. This is the intentional work that helps students grow. Skillful teachers support students in independent reading and small groups that are flexible, based on not only student levels but also to support areas where students can stretch in their reading. Dr. Mary Howard tweeted this little nugget of wisdom early on in the chat. It reminds me how important it is to look at what students need first. Often we find ourselves choosing books for students because they are our favorites, they are part of a program or they are recommended for a unit of study or to teach a particular strategy. What really matters is the child. We need to remember that books need to be relevant to kids. We need to sit down beside a child and talk about book choices for independent reading. We need to get books into kids’ hands, books that they can really connect to. We need kids to choose books for themselves for independent reading and at times when they need some support we have to think about the best way to do this. Nothing is more powerful than sharing with a child and saying, “I thought about you all weekend and I found this book for you. I really think you are the kind of reader who will get this book.” Ultimately our students need to read if they are going to become proficient independent readers. If something does not make sense we have to stop, think and ask why. @ChristinaNosek reminded us in the chat that we must always put purpose and intention first. Often we are racing day to day, trying to close gaps that widened over many years. We get so caught up that we don’t make time to think or ask why. If we want to create independent readers we have to create opportunities and experiences for students to practice that work in good chunks of time and in different situations. We have to always think about how we teach kids to read on their own. We have to put the child before the book and when things don’t make sense…ask why. When we identify goals for individual students, those goals should always remain at the center of instructional decision making. Additionally ensuring that students experience multiple texts at various levels provides them with opportunities to navigate complex texts. Through read-aloud, shared reading, book clubs, small groups, strategy lessons, guided reading or independent reading, students will be making meaning of texts at different levels throughout the day. These intentional instructional experiences provide meaningful practice through a gradual release of responsibility that guides the way for readers. We can maintain perspective by viewing reading levels in flexible ways as we support students toward increasing independence.